A couple of weeks ago my friend Rue wrote about her 100th post on her new blog. You can read her post here. After reading her post, I started wondering which one of my posts was the big 100, since I just blew right on past it and never looked back. After some extensive calculations, totaling up the number of blog posts I currently have by month, then subtracting the number needed to reduce it to 100, I found my 100th blog post.....and was absolutely exhausted afterwards. That was more math than I've done in 30 years....I had to go lie down! You can read that post here if you happened to miss it! I had 1500 posts from April 2009 till the end of July 2013, when I was moving back to Blogger from WP and lost them all! I started over the very next day and I post daily, so I have no idea where I am. 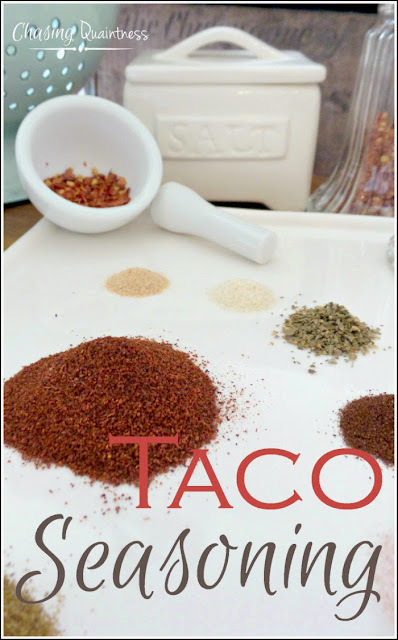 Taco seasoning is a good 100th! Christine, thank you and this seasoning is super easy and you can adjust it to taste by changing the amounts of each spice. I'm glad I'm not the only one! :-) And yes, to the next 100!! :-) Hugs!! Happy belated 100th! Spicy! I remember this post because I sent the recipe to someone. Too much math involved to figure out what was my 100th. I have blown past 600. I've never thought about that but my brain hurts just from trying to calculate it. I'll check yours out because we love taco salads and I worry about all the "flavorings" in the packets. Congratulations and I'm looking forward to many more posts! Thank you so much Dewena! I think you will like the seasoning...it can be as mild or as hot as you would like for it to be! LOL…better that than a “flopiversary” from one of my failed projects! ;-) And thank you so much! You crack me up! Love it and your 100th post. I read Rue's post too and loved it as well. Darrielle, thank you so much! Rue is such a sweetie and I love her blog!